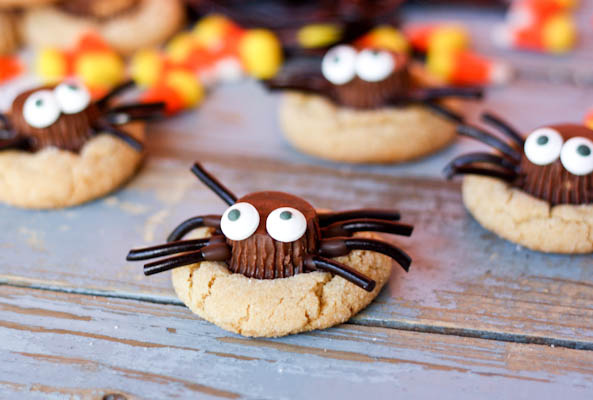 Peanut butter blossom cookies (the yummy peanut butter cookie with a Hershey's kiss on top) are one of my favorite cookies and Kristan turned them into the perfect Halloween treat by creating spider peanut butter blossom cookies. Her yummy recipe and a few fun store bought candies and you have a super cute Halloween cookie. I am thinking I might just drop the entire cookie on top of a frosted cupcake as one sugar Halloween cupcake topper. You can get her cookie recipe and find out how to make these spider peanut butter blossoms over at Confessions of a Cookbook Queen.